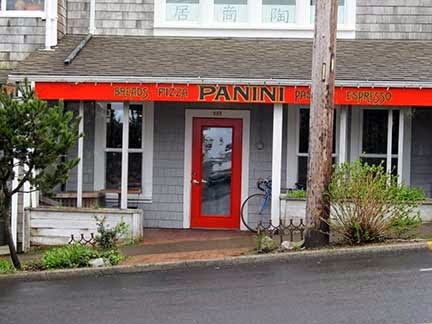 There is a great little bakery in Newport Oregon called Panini. It's about a 25 mile trip one way but it is the nearest "big" town. The owner is a relatively young man I'm guessing in his middle thirties. The shop has three tables and a sit down bar inside and 2 tables out front. The walls are decorated with local artist's work, always very eclectic. Nothing fancy about this place at all. We go there quite often for living so far away. They make the best mocha coffee I've ever had and the most wonderful pastries. They also make the most delicious eggplant sandwich. Today's post is all about trying to replicate this dish, let me explain. First the eggplant is roasted and then served on freshly made focaccia bread. Then the sides are slathered with an aioli mayonnaise topped with the eggplant, red onion, sun dried tomatoes and feta cheese, then drizzled with a balsamic vinegar. Did I mention how good this was.........My version is not exactly the same but it is a close second. Thanks Joey for all the great food. Slice eggplant into 1/2 inch rounds, then using fork tines poke rounds and then sprinkle with salt. Let set 15 to 20 minutes. Pat rounds dry using paper towels or clean dish towel. Pour olive oil into shallow dish and brush both sides of eggplant with olive oil. Place rounds on a baking sheet and bake 15 to 20 minutes until lightly browned, turn and roast on other side another 15 to 20 minutes. Remove from oven, set aside. Meanwhile, while eggplant is roasting, prepare the aioli. Remove skin from garlic, mash garlic and salt in a small bowl until a paste is formed. Whisk in mayonnaise, olive oil and lemon juice. Season to taste if needed salt and pepper. Take roasted eggplant, slice into fourths add to a small bowl then add sun dried tomatoes, red onion, feta cheese, 2 sprinkles of balsamic and combine together. Slather bread of choice with your aioli, then mound the eggplant mixture, place other side on top. Enjoy! Have fun Monica, eggplant is one of my favorite veggies. What a wonderful little restaurant. I love seeing you use eggplant, an under appreciated veg if ever there was one. Eggplant seems to be undergoing an uptick in popularity lately with recipes appearing in lots of outlets. I like seeing that. This sandwich sounds wonderful, just the kind of thing my husband and i would enjoy for lunch. Thanks for presenting it! Thanks Adri, it does seem to be under appreciated, thanks for stopping by. That sounds like a restaurant I would love to visit too, Cheri. Your eggplant sandwich looks very tasty. Thanks Angie, it was delicious, hard to go wrong with fresh veggies. I love eggplant and love the eggplant sandwich and the shop sounds wonderful. Thanks Suzanne, this shop is wonderful, probably a good thing it's 25 miles away. All the flavors in this sound incredible. I'm sure I would love it. Bookmarking the recipe for future use! Thanks Shari, we should start our own bakery between Phoenix and Gilbert. lol! I love this sandwich! I think a trip to the restaurant would be fun too. Hi Maureen, it is a great place! Thanks Dena, I had a lot of fun with this. I love it when you find a little place that isn't too fancy but takes pride in making the best of whatever they sell. Hi Amy, sandwich and a nap is always good, thanks! Hi Pat, great idea about the bruschetta appetizer. I agree, Newport is such a fun little town. Thanks Karen, that was very nice. A quick and tasty sandwich like this will make a great meal or snack for me. So flavourful! I'm a fan of eggplant as well. thanks! omg, this looks so so good!! This sandwich sounds fantastic. With all the vegetables I roast, I've never roasted eggplant, and this recipe would be a great place to start! Hi Beth, eggplant is so much better roasted like a lot of veggies. Thanks! Mmmm - this sandwich looks so good - roasting eggplant is the bomb! Hi Donalyn, I love it too, such great flavor. oh my gosh, this sounds so delicious! I love roasted eggplant and this is simply divine comfort food! I can see why you drive so far to get there, Cheri - so lovely to find such a special place! Hi Robyn, yes we love this place, though I had to set stern limits on myself about my visits. I'm so glad you decided to recreate this. It looks totally worthy an I can't wait to try it! Hi Abbe, it is wonderful! Oh! This sounds sooooo delicious! Thanks Marcela, thanks for stopping by. it looks like a cute place. oh, hooray! you got rid of word verification! thank you! Yes, I finally figured it out. Cheri, sandwiches are always wonderful, especially when made with lovely fall vegetables - nice idea to get inspired by one of your favorite sandwich please. ...of course, that should read "sandwich places". Too early in the morning around here, sorry about the typo. Thanks Andrea, it's fun to re-create a dish that I've enjoyed out. Hi Tandy, okay you caught me, yes there's a few more things! It's rare to find a vegetarian sandwich that's REALLY good...but this sounds seriously awesome! Thanks Joanne, it is a good one! I can almost "hear" the excitement in your voice as you share that lovely place and the meals that they serve. What an intriguing eggplant recipe. We will be celebrating National Eggplant Day on September 25th, I may just need to make this redition of the recipe. In the mean time, I'm going to add your link to the eggplant post I did the other day. I hope you don't mind. The <a href="http://www.monthsofediblecelebrations.com/2014/09/elegance-and-versatility-eggplant.html”>link</a> is here if you want to check it out. This looks great. I used to make a slightly different eggplant sandwich years ago and I forgot all about it until now! Thanks for sharing Cheri. Hi Peggy, i do the same thing, thanks! Hi Sherry, did not know eggplant is a fruit, very interesting. I love eggplant in anything! And I can imagine having some fun with different mayo flavorings! Lucky you to have such a fun place to go. Hi David, great idea on the mayo flavorings, you could go several ways here. My first eggplant sandwich was years ago..we went to Maine..with another couple..they are of Italian heritage..when she makes her eggplant parm..they have it cold in sandwiches..she had made some for our trip when we stopped at a picnic area. I fell in love w/ eggplant through them.. I try also to copy fave recipes..
You know I bet you he would give it to you. Although to me yours looks perfect. And what a CUTE place. Thank you, I would love it! I haven't been to Newport in years, but remember it at a sweet town. I would love this restaurant and can see why you wanted to duplicate the sandwich. It looks perfect for a late summer / early fall lunch (or dinner!). Perfect for the wimpy vegetarian that I am. We love eggplants 'round these parts. Pinned!